Why was such a distinct art confined to such a small group of villages? 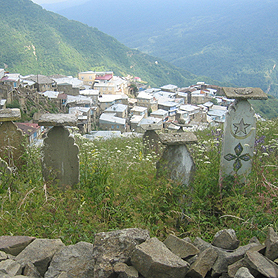 The answer lies in the way village life evolved in Daghestan. The Caucasus is the region between the Black Sea and the Caspian Sea, named after the twin great mountain chains which virtually cut off the north-south route. Daghestan borders the Caspian Sea, and from the earliest times the narrow coastal plain provided the easiest passage for armies or nomads to cross from Russia or Central Asia to the north, or from Persia, Turkey and what is now called the Middle East to the south. 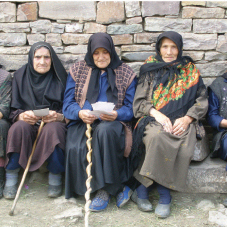 Today, there are 31 acknowledged ethnic groups living in Daghestan, amounting to a population of 2.5 million people (about five times the 1897 population), two-thirds of whom live in about 700 lowland and mountain villages. Among their number, although they are not separately counted as an ethnic group in the current census, are the Kaitag, a 'nation' of several nationalities, including various Hunnic, Turkic, Persian, Semitic and Ibero-Caucasian peoples. In the past they intermarried with the numerous other peoples who attempted to conquer Derbent and the Caucasus. Islam, Christianity, Judaism and paganism were all practised by them at various times. Many of the villages in the Kaitag area are built on foundations from 500 up to 3,000 years old. 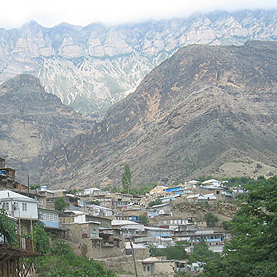 Before the Russians subdued Daghestan in 1859, most villages were run as free societies. The villagers not only refused to pay taxes to the nominal overlord but also extended their individuality to a local monopoly of the production of specific items, such as daggers, pottery, carved wood, flatwoven textiles and jewellery. At this time, marrying-out was virtually limited to particular villages in oneís own ethnic group. Women stayed at home and worked in the village and surrounding fields, while men rode afar to find work or, more often, booty. This self-contained pattern of living reinforced specialisation of local handiwork and resulted in a strong and unbroken design tradition, and the extraordinary ethnic and religious diversities of the Kaitag gave rise to the astonishing and powerful iconography of their embroideries. Kaitag embroideries were never intended for everyday usage, but were carefully put away and reserved for ritual occasions, primarily those connected with birth, marriage and death. In the Kaitag and south Dargi regions, a custom for avoiding the evil eye was to protect the baby with a talismanic embroidery, which might be brought out of the dowry chest, or newly purchased, given or embroidered on the occasion of the birth. 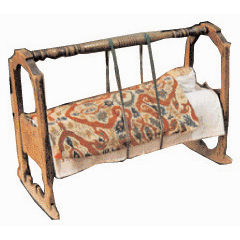 The embroidery was used as the cover over the head end of the cradle, with the embroidery facing inwards. In the Gapshima area the embroideries were also used at weddings. On the first day of a wedding, the bride brought her jewellery, sweets and other pre-marriage presents, wrapped in an embroidery, with the embroidered face on the inside, to the home of the bridegroom. The mother of the groom had given the embroidery to the mother of the bride, for the bride to bring. The embroidery was then placed on the dowry chest or over a dowry bolster. Embroideries were finally used at death. As it is forbidden to look on the face of a dead person, it was immediately covered with an embroidery, embroidered side down. There is even a saying, 'What will be put on my face when I am dead?' 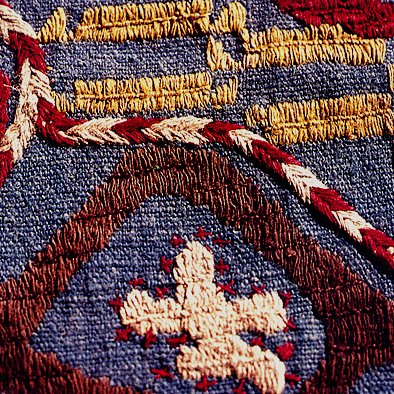 When the shroud was tied or sewn up, the embroidery was removed. It was never buried with the corpse, but passed on to the next generation. In the mountain hamlets, it was the embroideries with cosmic designs that were used as face covers on death. Silk yarn is embroidered on a ground of cotton, or, more rarely, silk. Plant dyes are used for both yarns and grounds, except in a few examples with early chemical dyes such as Fuchsine from the 1860s, and some modern examples with garish chemical dyes. The embroidery is worked on a rectangle formed by the previously joined ground cloths, not fastened to a frame. 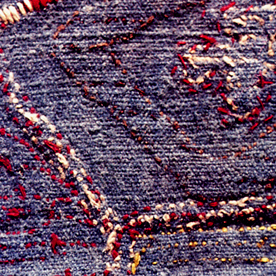 The silk thread used in the Kaitag embroideries is of many qualities and sheens, and the variation in a single piece indicates that it was hand twisted by the embroiderer. It is reported that silk used to be widely produced in Daghestan and that there were plenty of mulberry trees there. 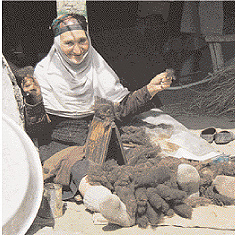 There is still large-scale silk cocoon production by Avars near Belokon and Zakatal in northern Azerbaijan. The climate in Daghestan is not suited to growing cotton, but it was available, raw, spun or woven, in the Derbent market. The nearest production was from areas of Nakhichevan and Armenia that had suitable climates. The narrow woven cotton backing of most of the embroideries appears to be handmade and could have been woven on a horizontal loom. That cotton was exported from neighbouring Azerbaijan, on the trade route from Persia to Russia, is confirmed by the earliest surviving trade records from the 18th century and up to 1812. A large variety of natural dyes was available locally. For silk, at least eleven yellows, two blues, one black, four browns, four greens and several natural dyes for red have been identified. Derbent was famous for exporting the roots of the madder plant, which was cultivated in the nearby plains and yielded a range of reds. Cochineal was probably imported from Armenia, Azerbaijan, Turkmenistan or the Ukraine. Lac was imported from India via Persia, as was indigo blue. Plants for yellow dyes, mainly weld, were grown locally. The extraordinary variety of both the shape and the scale of the designs is in contrast to the standard sizes of the ground cloths, which depended on the dimensions of the cradle. 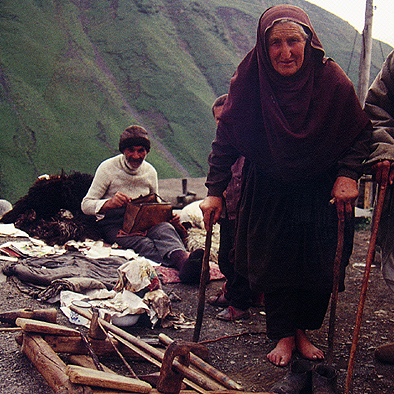 The ground material is usually handwoven cotton (there are two examples here with silk grounds, possibly bought as woven cloth from Sheki, a well-known silk trading centre in north-east Azerbaijan), of a narrow loomwidth, about 50 cm, which could have been woven on a small horizontal loom. The cradle-size dimensions are made up by a rectangular patchwork of narrower bands. The change in colour in ground cloth with different rectangular blocks stitched together was often clearly positively intended, not merely the result of a lack of dyed cloth, as is demonstrated by a single-colour cloth backing to a patchwork embroidered front. The embroidery is usually worked freehand, with the outline stitch probably worked first. In spite of the assured composition of the designs, drawn outlines are found in only about a fifth of the embroideries, and even these are not always followed exactly by the embroiderer. 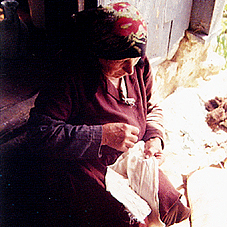 The main type of embroidery, a laid and couched stitch, is not found elsewhere in the Caucasus or adjacent regions. There is also a variety of other outline and infill stitches used in combination for a single embroidery, which is unusual by Caucasian standards. A shifting positive-negative effect is produced in small elements of the composition by using the ground cloth to carry the design and then reversing its role, so that the embroidery carries the design. It is remarkable how little thread is visible on the reverse side of a Kaitag embroidery, while the front is usually about half covered in glowing silk, contrasting with the ground cloths of various colours. The stitches seem to be the most economic ones necessary to produce a dazzling effect, showing off the maximum amount of silk and creating a variety of textures, from glossy single directional laid silk, to sharp outlining and sparkling infill stitches. The versatility of the embroiderers is demonstrated by the range of the sixteen stitches that have been identified. There are almost always at least two stitches in a Kaitag embroidery, an outline and a filling stitch, and there are often several additional outline and emphasising stitches. The women who carried out this work were experts of technique who enjoyed their role as artists of design and colour.